Cloud watcher; stone cutter; paper scribbler; blues picker; intuitive navigator. Many thanks to those following this page who have bought books. There has been something of a modest rush over the period of the launch which has subsequently tailed off for the time being. But there is interest from various sources and I am currently working on three different articles; 1300 words for map/cartography journal, 2000 for a lettering/typography/print journal and a piece for the London College of Communication (London School of Printing, where my father studied before the war). There has been much kind and appreciative feedback for the book, The Brunswick Prison Camp Map Printers, whichever copy has been bought, and we have sold almost a third of the numbered letterpress edition of 150, and about 30 of the digital print facsimile edition, so more work to do, and I’d like to get a piece on BBC Radio4 and perhaps my local radio station here in the UK. I have my father’s POW diary which I have been referring to for the articles I’m writing, and the next plan is to transcribe that from his handwritten version to a more legible digital archive. Not necessarily for print, but for the record and to better understand it. Letter from my father to The War Office in 1947 requesting clearance to publish an article about The Brunswick Printers at some point in the future, and their reply. Back in Cambridge and back to relative normality (in my case a dusty workshop and chipping stone) after the build up to the launch in Liverpool. Of the green covered 150 numbered letterpress limited edition, around 45 have now sold, within 2 weeks, and when they are gone, they will be gone. So far we have sent to Australia, the U.S., Poland, France and all over the UK. There has also been encouraging sales of the red covered 300 digital print facsimile edition, and there is potential for a second edition subject to demand and further publicity. I have been asked to take the original launch display up to the Brunswick Youth and Community Centre on their 70th anniversary celebrations in April. This was set up as a boy’s club by my father and fellow Brunswick POW’s from Liverpool Mike Marshall and Harry Mounsey in 1947 and is now partnered with The Jamie Carragher Sports & Learning Academy and the Liverpool Tamil School. In the meantime, I am interested in other opportunities to get this story into the light of day after its long rest in folders of manilla envelopes in a box for 70+ years, in between taking book packages up to the Post Office most days and working on my stonework and sculpture. Sunday 26th March; what a great day after 3 years of working on The Brunswick Prison camp Map Printers! Ken Burnley and I had booked the Sandon Room at the Bluecoat, Liverpool, home of Juniper Press, a while ago. I drove up from Cambridge via Shropshire on Friday, and we spend Saturday setting up and preparing the room. I am fortunate to have a considerable amount of original material relating to The Brunswick Printers – photographs, prison camp documents, letters, drawings, my father’s original articles, and we made an exhibition up from all that was relevant. This went from my father at London School Of Printing, WW2 in N Africa, his imprisonment in Oflag79, the press, and his years at Tinlings printers in Liverpool where Ken Burnley was an apprentice, and through to Ken’s Juniper Press. Despite it being a bright and sunny Mother’s Day, a lot of people attended. ; people associated with my father’s life, Ken Burnley’s and my own. It’s extraordinary how what has mostly lain in a cardboard box for 70 years, and what I’ve often considered to be “something my old man did in the war” is actually something so unique and fascinating when it is compiled, curated and exhibited. One aspect of the day that was particularly interesting to me was meeting people connected to the Brunswick Youth & Community Centre in Bootle, that my father and fellow ex Brunswick POWs Mike Marshall and Harry Mounsey had set up as The Brunswick Boy’s Club on their return to Liverpool after the war; a thriving organisation celebrating its 70th anniversary this year. It looks as though I will be back up in Liverpool with the map and POW display panels in April. It was a day that was the culmination of 3 years of work, and 3 years of a labour of love by Ken Burnley. I’m not sure about the attention, but my father would have loved the aesthetic of the letterpress production and the care taken over every aspect…… papers, fonts, layouts, binding etc. A lot of talking, a lot of connections and re-connections, a lot of interest, and yes, some more books out into the world. Thanks to all for making the effort and being there. So, 29 orders in from Wednesday when we installed the Paypal buttons……… packing boxing and shipping out to the U.S., Australia, Poland and all over the UK. If you’re one of the buyers, the books will be dispatched from Monday and in the following couple of days from here in Cambridge and from Juniper Press in Liverpool. With only 150 of the numbered letterpress edition and the book launch in Liverpool on the 26th March, they will be going, and once they are gone, they will be gone. The facsimile edition (300) is also available – see contact page for purchasing options for both copies. It’s been fascinating to see the power of the internet merging with passion for letterpress! We have PayPal, we have buttons and we have started shipping and dispatching. The first orders came in overnight including ones from Poland, the U.S. and Australia. It’s a small project, but one that has taken since 2014 to put together when Ken Burnley and I first met at Juniper Press in Liverpool. It would not have been possible without his passion, vision, skill and craft to imagine it and to see it through. As the frontispiece says “This is a book about maps – real maps of place and terrain; a book made possible through the maps of lives, time and chance”. It is dedicated to my father, Philip Radcliffe-Evans and to his brother, William Lees-Evans who was killed in action in 1941. William Lees-Evans and Philip Radcliffe-Evans at Glyn Ceiriog, Wales. 1939. Building up to the book launch of The Brunswick Prison Camp Map Printers at the Sandon Room, Bluecoat, Liverpool 26th March in the afternoon. We’ve been going through all the related material and documents and been printing and enlarging and printing captions for an exhibition. We’ve procured exhibition boards. We now have a dedicated bank acc., a PayPal acc. and we WILL have PayPal up on the website by then. If anyone is in striking distance of Liverpool and would like to attend, please contact me, Mark Evans, via the website and I will send an invitation. Myself and Juniper Press would be delighted to see anyone interested in letterpress, printing, maps, cartography, Liverpool, WW2 who would like to attend by invitation. Both copies of the book The Brunswick Prison Camp Map Printers will be available…… the letterpress limited edition (150, numbered), and the facsimile edition (limited to 300). Nearly there; 150 letterpress bound, numbered and ready to go. All we are waiting upon is finalisation of a dedicated bank account and Paypal on this site. The latter isn’t a problem, the former seems to be taking an inordinately long time. To anyone who has pre-ordered, I have your e mail details and will let you know when we are live for sales will ask for all delivery details. The books are looking (and feeling) beautiful, and have made a really fitting tribute to my late father and his achievement in creating and operating the Brunswick map press in Oflag79. He died in 1992, and was a modest man, with a love of all things made by hand and eye and worked on with time and skill. This is just such a book, and all due respect and thanks to Ken Burnley at Juniper Press for his passion, enthusiasm and love of the craft for making it possible. I’m hoping that within a week from today we shall be able to start posting & shipping. I shall alert via e mail, social media and on here. The cover of 1951 Printing Review Special Map Number with the original article by my late father, Philip Radcliffe-Evans, on the Brunswick Map Printers. We have reprinted it verbatim in The Brunswick Prison Camp Map Printers letter press edition, Juniper Press, Liverpool, limited to 150 numbered copies @ £45.00 GBP https://thebrunswickprinters.com/ We are just setting up a dedicated bank account for this project, and a Paypal facility on the website, at which point current orders will be processed and all future enquiries addressed. There will also be a 300 copy run of digital facsimiles @ £18.00 GBP which are currently being bound. There will be a small official launch at the Bluecoat, Liverpool by invitation on the afternoon of Sunday 26th February 2017 2-4 p.m. – if you are seriously interested in attending, e mail me and I will send an invitation. I shall be in contact with all who have placed firm orders as soon as the bank account is operational. 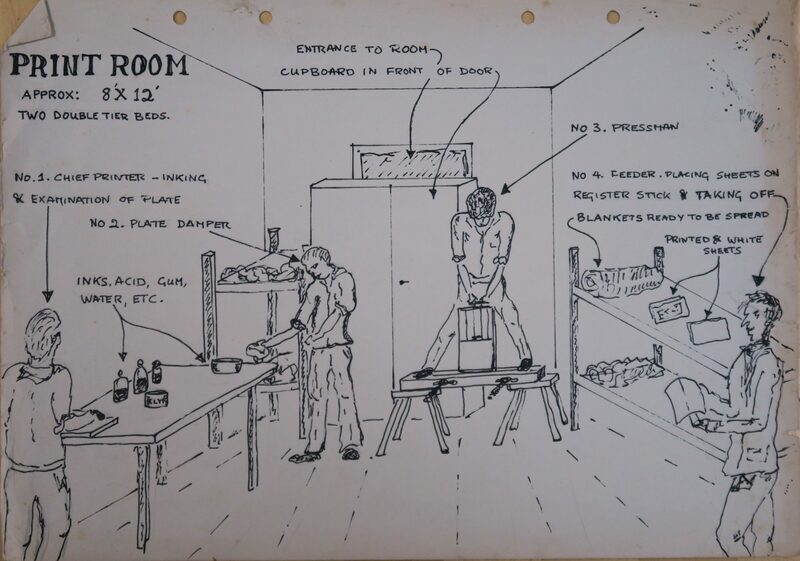 I am posting a page a day from The Brunswick Prison Camp Map Printers on the Brunswick Map Printers Twitter page. 32 pages, 32 days. Myself and Juniper Press are launching the book on Sunday 19th March at The Bluecoat, Liverpool where Juniper Press is based and where the book is being printed. If you would like to follow the Twitter page, click on this link “Brunswick Map Printers“.